Search Engine Optimization Step 2: In Search Engine Optimization we improve results from the traditional search engine listings often referred to as the "editorial', "organic", or "natural" results. Improving "organic" search engine results from your web site! Based on the results of our Initial Site Assessment and Competitive Analysis we may recommend a detailed Search Engine Site Audit. In a Site Audit we perform a very extensive analysis of your web site to ensure that it is "search engine friendly. Having a "search engine friendly" site, a web site with no barriers to the search engines, is critical to success with “natural” or “organic” search engine results. We go through your web site to get an understanding of the site architecture and the tools used to develop the site and identify any problems with the site design or other limitations that might impede organic search engine results. • Review of pages indexed in major search engines to see how the sites/pages are listed and look for problems. • Look for issues unique to dynamically driven site content such as is typical with Content Management Systems (CMS) and ecommerce sites like duplicate content issues. 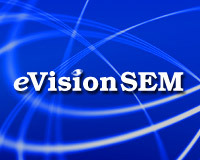 eVisionSEM founder George Aspland has been developing and optimizing web sites for companies and organizations, large and small, around the world since 1998. He speaks regularly on the subject of Search Engine Optimization (improving results from search engines) and is author of the book, The Guide to Search Engine Marketing, a step-by-step approach used by organizations seeking to optimize their web sites.